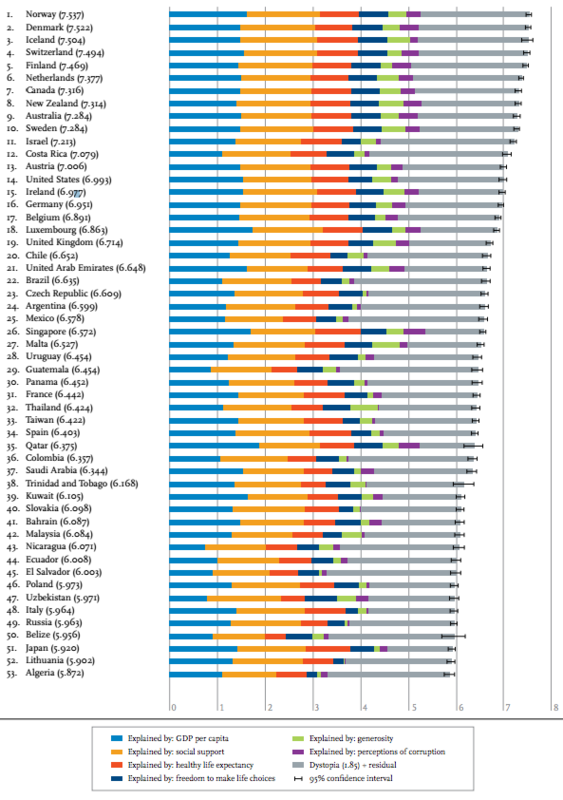 Canada is one of the happiest countries in the world. Based on a mix of economic, social and health-related variables, the World Happiness Report ranked Canada as the seventh happiest country, following closely behind Norway, Denmark, Iceland, Switzerland, Finland and the Netherlands (which bumped Canada out of last year's sixth spot). Produced by the Sustainable Development Solutions Network, the report was initially published five years ago to support the United Nations' high-level meeting on happiness and well-being; the 2017 version was released on March 20th, the International Day of Happiness. Six variables accounted for the biggest differences between countries: GDP per capita, healthy years of life expectancy, social support (as measured by having someone to count on in times of trouble), trust (as measured by a perceived absence of corruption in government and business), perceived freedom to make life decisions, and generosity (as measured by recent donations). Canada, along with all the countries in the top ten, excels in these areas. According to the report, part of Canada's high happiness score also comes from its tolerant approach to multiculturalism, via programs that promote inter-ethnic understanding. "When thinking of what development advances mean, many are still drawn instinctively towards measures of economic growth," Helen Clark, the head of the UN Development Program said in a recent speech. "But the quality of growth matters a lot — whether it is inclusive and sustainable has a major impact on human development and wellbeing. "While income is a crucial contributor to well-being, it is far from being everything," Clark added. "As the old saying goes, we do not live by bread alone."